Unfortunately paid employment has limited my fishing opportunities of late. The weather has also made things tricky with some windy mornings. Sunday was not ideal but I had to get my fix. 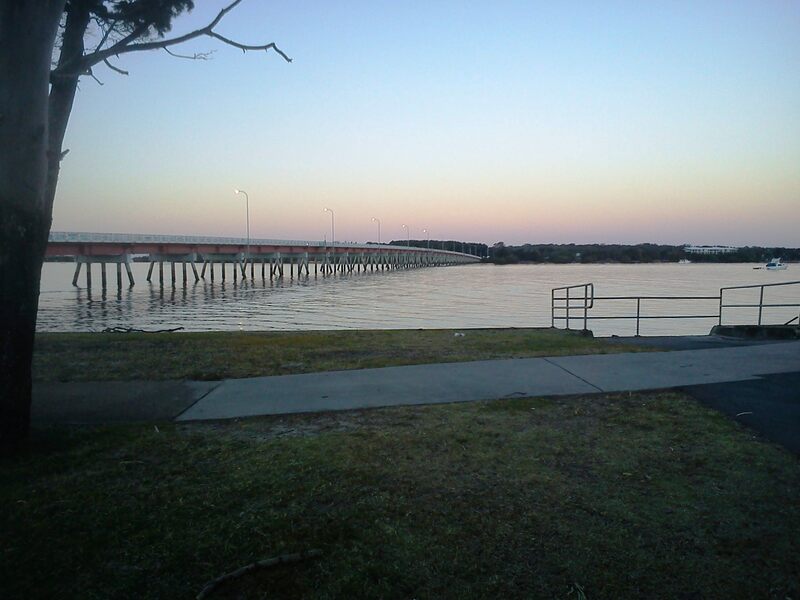 I arrived at Bribie Island about 5.45 am and conditions were better than I expected. The tide was running out and would be low at around 9.00 am. The wind was from the south at less than 10 knots, but it was building. I started under the bridge on the island side. After a few casts I could see there was a lot less of the clinging ‘snot’ weed floating around. There was no surface action under the bridge lights. I decided to cast a soft plastic around just to the north of the bridge. After five or six casts with a GULP 4″ Minnow in the Pearl Watermelon colour, I felt a couple of bites. Next cast and the rod tip went mad. It was a Tailor just under 30cm. I caught a few more around the same size and then decided to move down to the mouth of the tidal lagoon, in front of Buckley’s Hole. I waded out just to the south of the new Bribie Island Seaside Museum. Looks very flash – but I would have preferred to see my tax dollar spent on something a little more essential! Like more gutting tables, hot showers and massages for tired fisherman, etc. There is a small drain here, just to the south of the main island jetty, and on a run-out tide there are often fish around. After a few casts I had a Tailor – about the same size as the previous ones. I had switched to a GULP 5″ Jerkshad in the Lime Tiger colour. I let it go and carried on casting over the coffee rock drop off, that forms the edge of the Pumicestone Passage. I have not caught a Pike for a few weeks – I can only assume the marauding Tailor have either eaten them or scared them off. A few casts later a fish grabbed the plastic, just on the top of the ledge. It was slower and heavier than the Tailor, as I dragged it back to the sand I could see it was a Flathead. It was around 45cm – things were looking up. I started to head south, casting out of over the ledge and gradually skipping my soft plastic in close to the edge. There were small ‘hardy heads’ all along the drop off and every now and then they would scatter as something smashed into them from below. I switched to a 3″ Minnow in the Lime Tiger colour. After a couple of casts, a fish grabbed it and tried to hide down under the ledge. I gave it a bit of line then tightened the drag and pulled it up and over. It was a decent Bream around 30 cm long. A few more casts produced another fish, about the same size. I carried on moving up and down the ledge for another hour. A couple of times I was bitten off by what I assume were Tailor, but I did not land any more fish. I was fishing with 10lb leader which is no match for their teeth, but necessary to tempt the Bream. Overall, it had been a better session than last week. Not much to say – a crap mornings fishing. I started about 6 am. I waded down to the big sandbar south of the old oyster jetty. Low tide had been at 4.15 am – so the tide was running in, strongly. The wind was low at first but gradually built to a 15 knot south-westerly as the sun came up. It had been blowing a south easterly the day before and we had had a bit of rain. There were tufts of algae weed floating around everywhere. It was the day after full moon. The Bream should have been in full swing and there should have been a few Flathead and Tailor around. But after 3 1/2 hours of fishing, I had only had one serious bite, which I think was a Chopper Tailor. I was fishing with my trusty GULP soft plastics and tried every colour and shape in the bag. The weed and wind did not help and perhaps the ABT competition, the day before, may have slowed things down, but it was no fun at all. I eventually gave up and went for a coffee and a bacon sandwich – scoring a duck is never a good feeling!! Unfortunately the requirement to feed my family (they want to eat something other than fish) has resulted in a pause in my fishing reports. 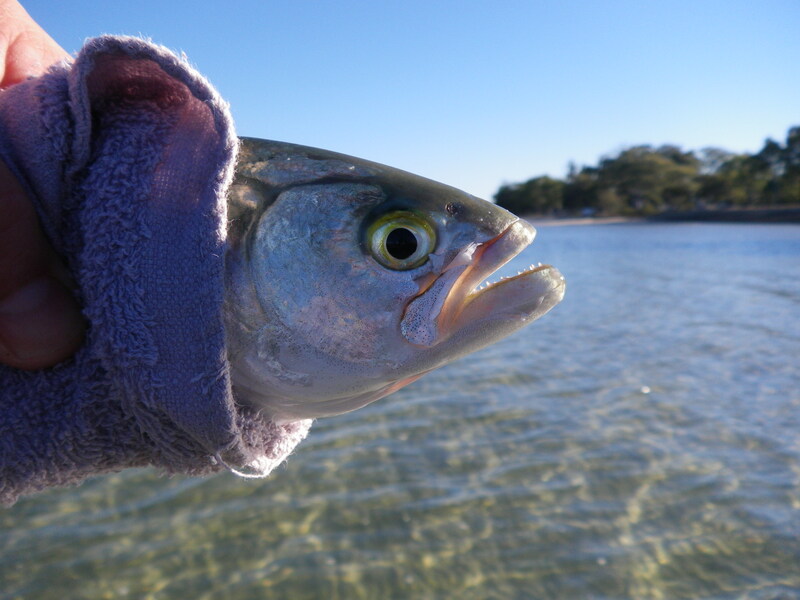 This morning I had an opportunity to get back out there and even though the wind was up (south-westerly at about 15 knots) and it was only 5 Celsius , I drove up to Bribie Island in search of fish. I had a couple of casts under the bridge, on the island side, just before dawn with a GULP 2” Shrimp soft plastic, but got no touches. As the sun started to light up the sky, I headed down to the mouth of the tidal lagoon in front of Buckley’s Hole. I waded out towards the drop off at about 6.30am. I carried on fishing with the GULP 2” Shrimp in the Pepper Prawn colour, mounted on a 1/6th 1 hook jighead. I was using 10lb Fluorocarbon leader tied on to 10lb breaking strain braid. I could not find the Flathead but at about 7.00 am, just to the south of the mouth of the drain I caught a good Bream, around 30cm long. 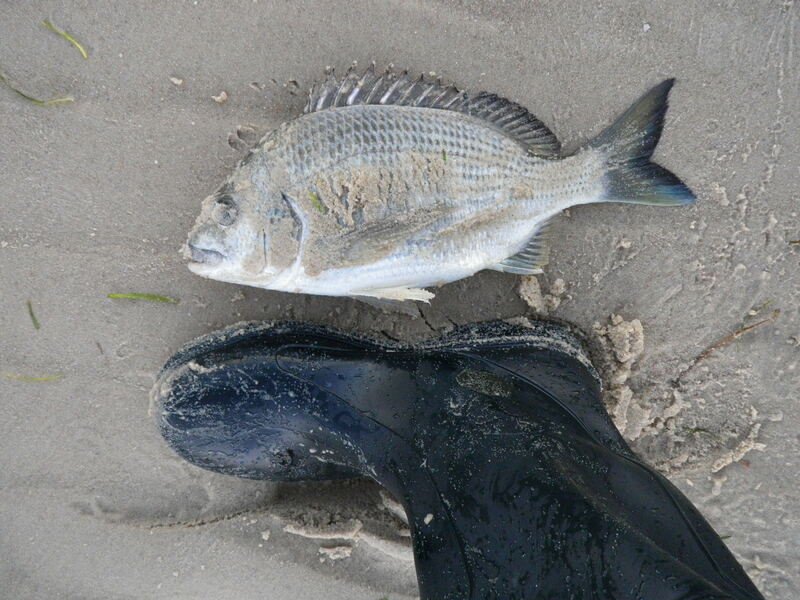 I few casts later I caught another, smaller Bream. The Pike seem to have disappeared from this area at the moment – not sure why. I waded further south. The wind was very cold but was beginning to drop off. 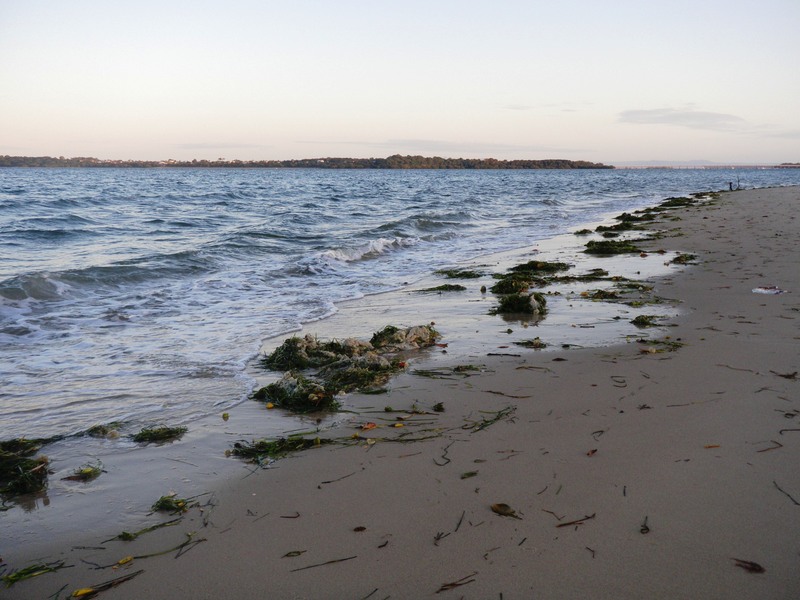 The tide was running out strongly – high tide had been at about 4.30 am. I waded, casting all around, all the way down to the corner with Red Beach. 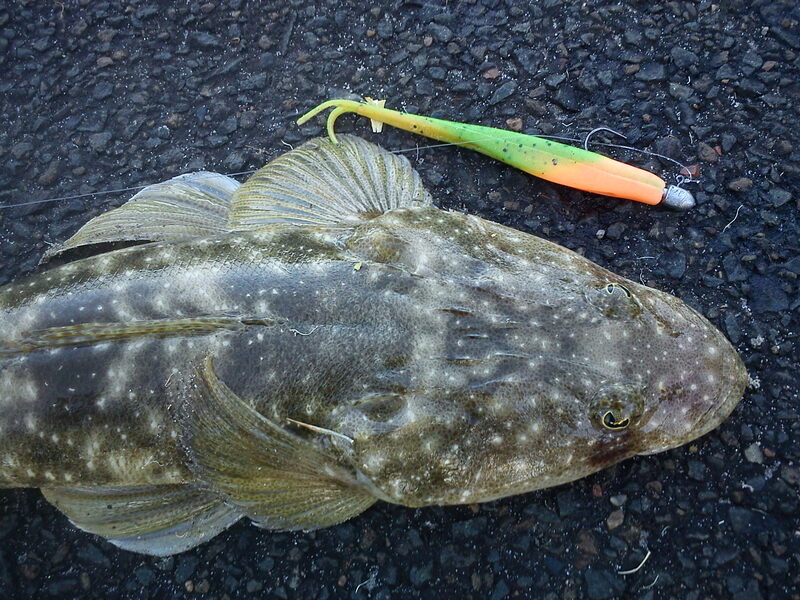 After about an hour, all I had caught were a couple of 20 cm Flathead, so I turned around and walked back to the north. I soon found myself back at the mouth of the Buckley’s Hole drain. The tide had slowed down and I had switched to a 3” Minnow soft plastic in the Pepper Prawn colour, rigged on a lighter, 1/8th 1 hook jighead. I felt a couple of hard hits and then I hooked a fish. The rapid rod tip movement showed it was a Tailor. I unhooked it and took a quick picture before releasing it. It was just under the legal size at about 28cm. Over the next hour I caught three more that where all around the same size. They took both natural and brightly coloured plastics. It seemed like a small school was moving up and down along the coffee rock ledge, which runs parallel with the shore at this point. By 9.30 am I was too cold to carry on, so I packed up and drove back to Brisbane. I released all the fish today. Monday morning was my last session, land-based fishing at Woody Head. The weather had improved and we had clear skies and no swell. I started fishing around 9.30 am at ‘the Barnacles’ area, again. Low tide would be around 11.30 am. 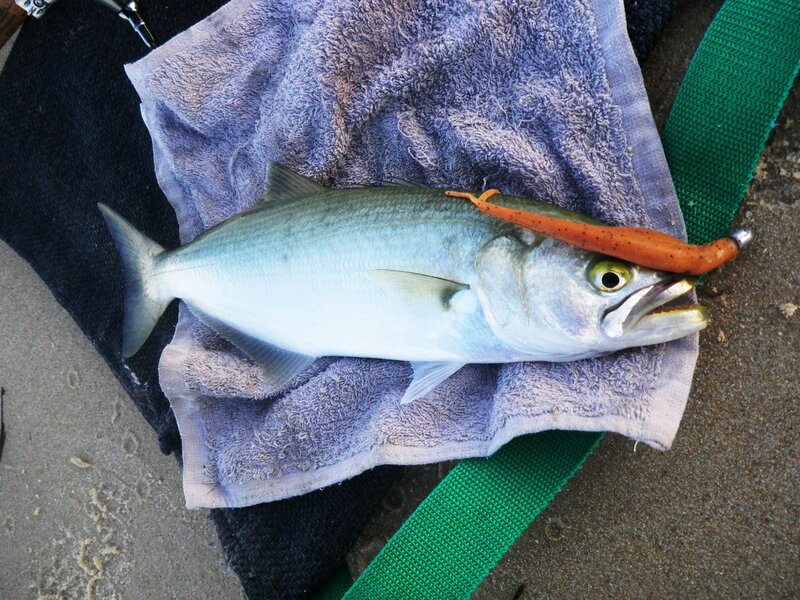 The first cast produced a small Trevally, who fell for the GULP 4” Minnow soft plastic in the Lime Tiger colour. I then caught a few snags and then a small Bream. Over the next hour or so I caught six or seven more Bream – all between 25 and 35cm. I moved all along the front of the rock platform, casting at any fishy looking water. There were plenty of people around – taking advantage of the excellent conditions. One guy had caught a nice looking 50cm Tailor on a slug. It was the only Tailor I had seen caught in the whole weekend. 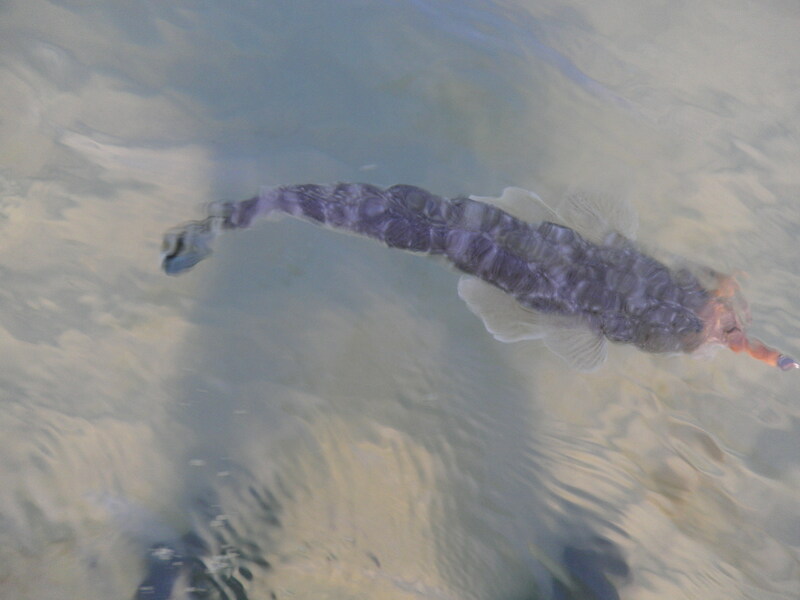 Further along I saw another fisherman with a 50cm school jewfish, which he caught on some fresh mullet strips. I caught more Bream as I walked along the rocks, down to the area at the southern end of the platform, known as ‘Mossies’. I caught more fish on the smaller 3” GULP minnows on light jigheads – 1/6th and 1/8th oz. 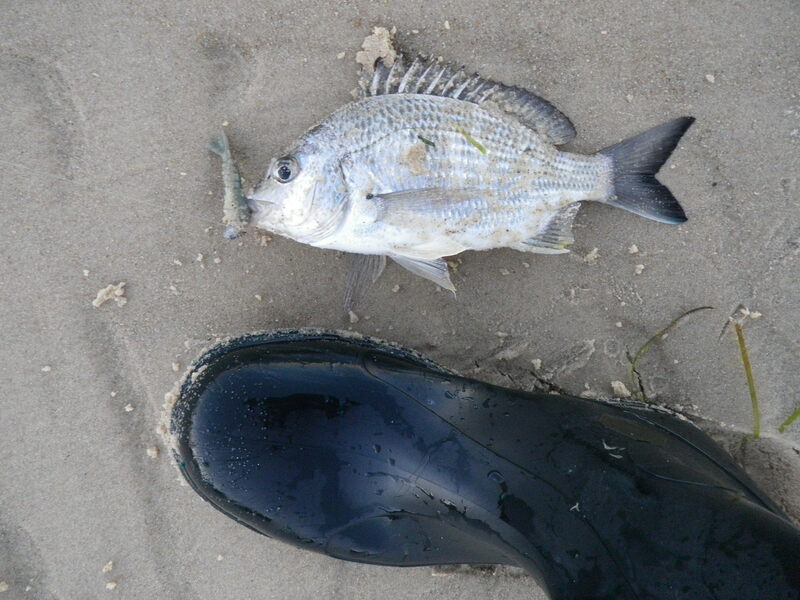 Another fisherman was catching plenty of Bream on unweighted squid pieces. By about 12.30pm it was time to go. It had been another great few days of land-based fishing, from the rocks in Northern New South Wales. The big Jewfish had been the highlight but there were plenty of Trevally and Bream, as well. I had not been fishing at dawn, but I was a little surprised by the lack of Tailor – maybe next time. Sunday morning was slightly less grey and cold. I arrived at ‘the Barnacles’ on the Woody Head rock platform around 9.00 am. The wind was a little stronger than the day before, but had swung round to blow from the north-west. Low tide would be around 11.00 am. The swell was under a metre. I started with a GULP Crazy Legs Jerkshad soft plastic in the Pink Neon colour. I had it rigged on 3/8 oz 3/0 jighead. First cast and bang, a fish grabbed it, as I was about to lift it out of the water, just at the edge of the rock shelf. I ran up and down the ledge a couple of times and then I lifted it over the edge with a surge of water. It was a Trevally, around 40cm long. It had tea coloured flecks all over it – so I suppose it was a tea leaf Trevally. The plastic was smashed so I bit the head off and loaded it back on to the jighead. A few more casts and I was snagged. I pulled the rod slowly backwards in a straight line until the leader and jighead separated. Fishing these ledges is expensive. The fish are always very close in so you get snagged in the rocks regularly. I put another plastic on, cast out and a fish hit it a couple of times on the retrieve. On the next retrieve in the same spot – bang – zzzzzzzzzz as a fish grabbed it. 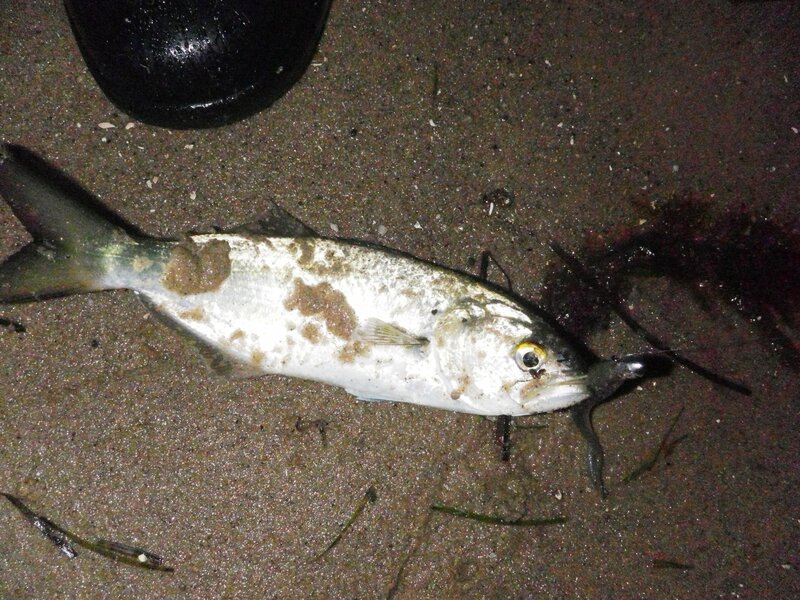 After a few runs it washed up at my feet and I could see it was a Golden Trevally – about 50cm long. A couple of casts later I caught another about the same size. I fished on for an hour or so and caught a few good Brea, between 28cm and 35cm – on a range of GULP soft plastics, both big and small. The Bream were a consistent catch all along the rocks and I think they are all schooling up to spawn now. I gave up as the tide started to run back in again at lunch time. It had been another great land based fishing session, off the rocks at Woody Head. Saturday morning was dull, grey and cold. The wind was still from the south west and there had been some early showers. Low tide would be around 10.45 am. There was a light swell off the rocks in front of Woody Head. I arrived about 9.00 am and I started with a GULP Crazylegs Jerkshad soft plastic in the Pink Shine colour. I had it rigged on 3/8 oz 3/0 jighead. On my first cast a fish grabbed it, just at the edge of the rock shelf. It ran up and down the ledge and then I lifted it over the edge, with the swell. It was a decent Trevally, around 55 cm long. I bled it and went back for more. I cast out and a fish hit the lure as it sank – but there was no hook up. On the next cast as a fish grabbed it as I jigged it up off the bottom. After a few runs I calmed it down and lifted it over the rocks, with the swell. 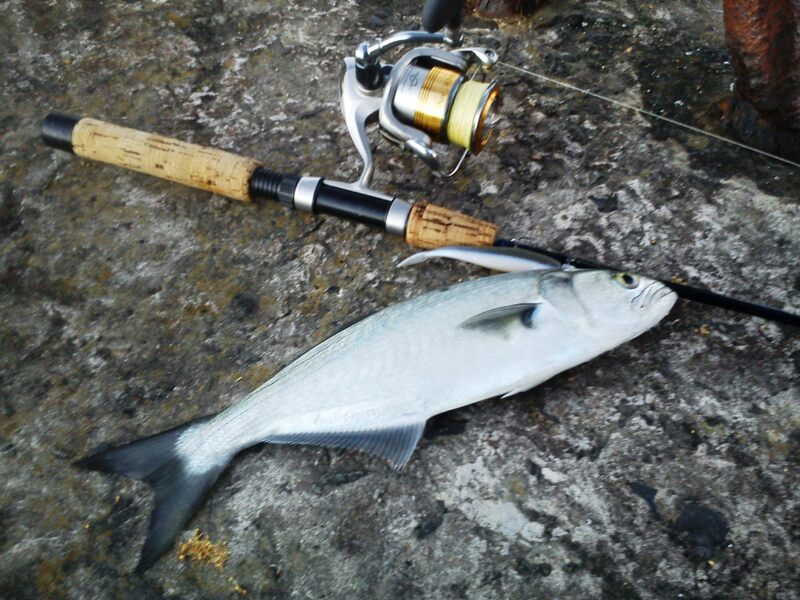 It was another Trevally – about 50cm long. 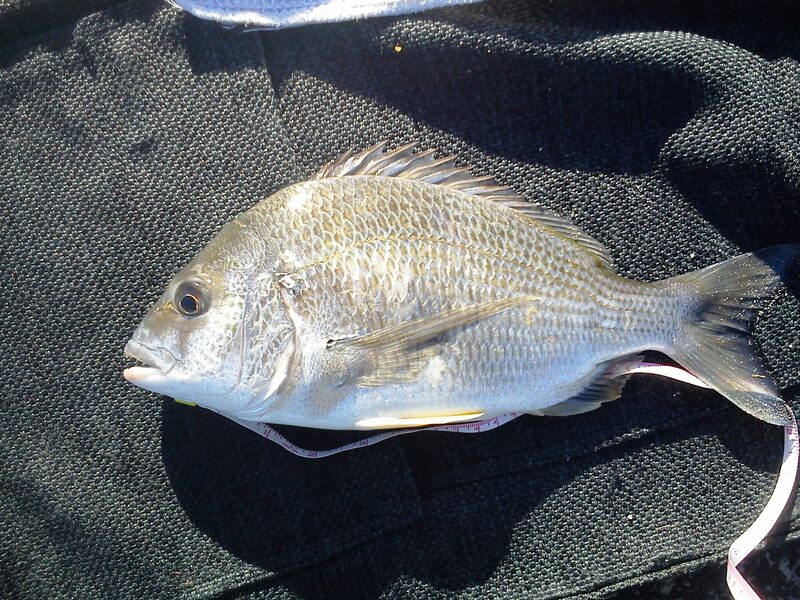 I carried on for a while and caught a couple of Bream and a smaller Trevally, which I released.